Foresight- Generally, dorm rooms are quite small, and it requires quite some premeditation and foresight to find furniture or other knick knacks that will fit according to the scale of the room. Also, be sure to take the stuff that is allowed on the premises. Any other extra things will only add to the clutter, and it will be difficult to ship back and forth. Share- Sharing electronics like tv, microwave, iron, refrigerator, etc can help save a lot of space. Contact your roommate and decide who gets to bring what. Multi-functional things- Having things that serve more than one purpose can help save space and be useful to the utmost, as well. A bed with a storage feature can be extremely handy. Also, a pen, which can also function as a flashlight contributes to the cause of cramped space. A calendar that can also function as an alarm clock will be indispensable in college life. It will help you keep track of your assignments, due dates, parking permits, tuition fees, etc. Utilize wall space- Storing books, accessories, toiletries, bags, etc on a desk or on any such place will leave little room for reading or writing. So, install shelves on walls and you can store a lot of your stuff easily. Focus on needs and not luxury or comfort- Decide what things are essential and what things can be shared or used communally. Also, think about the frequency of use. Things that are cute or have no use other than occupying space should best be leave at home. Maximize usage- Use corners and back of doors for hanging and storing stuff. Also, use clear bags and organizers in the closet and drawers to store undergarments, socks, gloves, hats, etc. Use the inside doors of the closet. Hang an extra rod in your closet to store more clothes. Seasonal clothing- You should pick out only those pieces of clothing that are suitable for the current season. The rest can remain at home, and you can switch your clothes when the seasons change. Storage containers- Laundry bags can take up a lot of space. Use containers that can be folded to fit into a small space. Also, storage containers that can fit under your bed or desk can be used to store the infrequently used books, parkas, jackets, etc. Files, binders and pockets- For storing handouts, notes and other loose sheets of paper, use binders and files. Also, use sheet protectors to protect the documents in case of moisture or spillage. 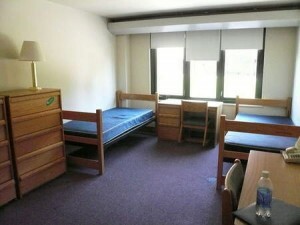 Personalization and imagination can be the keywords while decorating and organizing a dorm room. Organizing can help make your life effortless and easy and save you time and unnecessary tension and hassles.